Anyone can visit the website, Furniture installations can be borrowed or commisioned Artist, Jenny Polak, 3D interaction designer Peter Mackey. Jenny Polak and art galleries where her work is exhibited. 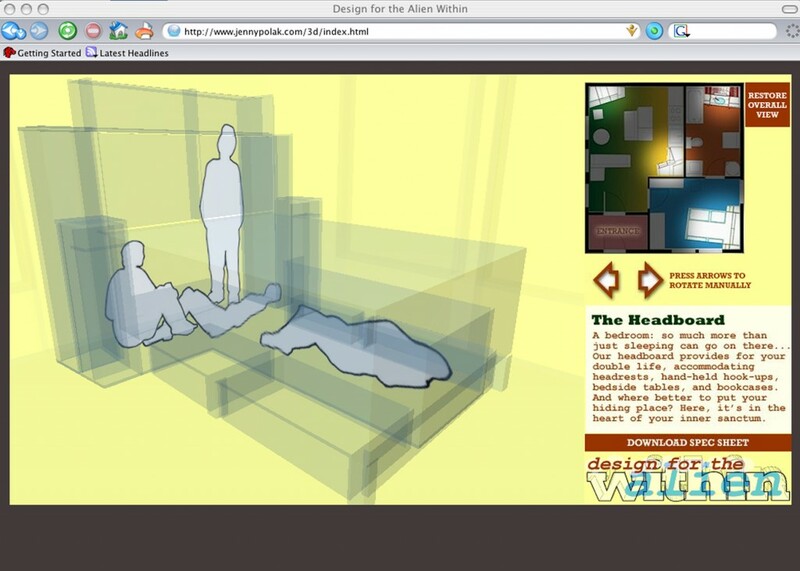 Web-based interactive design tool; tactical fiction that presents itself as a tool to â€œhelp equip peopleâ€™s homes to meet the needs of undocumented immigrants for the 21st Century.â€ Website launched 2006. A built example of furniture with space for hiding was displayed at the Newark Museum 2006. Other examples followed. In March 2010 the artist did an installation of a fictitious Hiding Unit occupying a vacant space between ceiling and floor of the BRIC Rotunda Gallery in Brooklyn. To raise awareness about the precarious living conditions and danger faced by people living and working without immigration papers, and promote resistance to anti-immigrant authorities. By initiating â€˜in-storeâ€™ gallery performances, the artist was able to bring additional awareness to the project and the issue.